FPV stands for First Person View, and is a form of flying that allows you to see what your drone’s camera sees. Many flyers like to wear VR goggles as their display, while others prefer standard transmitter or mobile device displays. 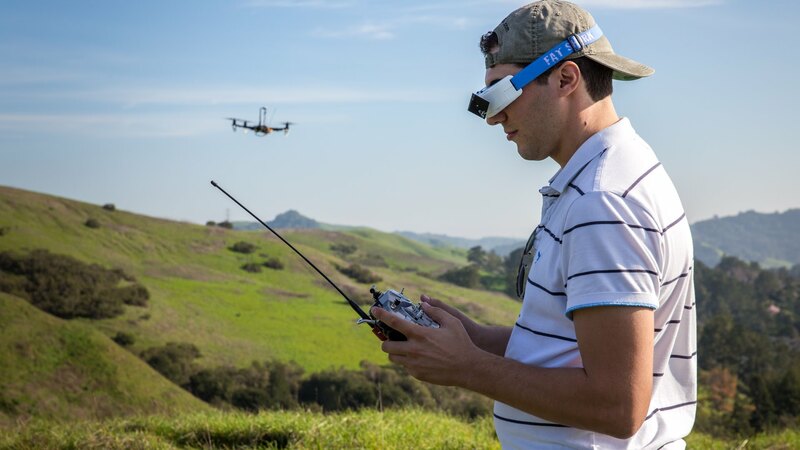 In this article, we’re going to talk about how anyone, including beginners, can get started with FPV flying. Building vs. Buying – Which is Better? When it comes to FPV flying, you have two options: you can buy a drone that comes with FPV capabilities, or you can build one. Many beginners will go with the first option since it requires no knowledge about how drones work. Experienced flyers, however, often prefer to build their own FPV drones since it gives them for flexibility. If you’re interested in building a drone, we’ve got a great guide for getting started. Most flyers can agree: flying with FPV goggles is way more exciting than flying with a standard transmitter display. It allows you to immerse yourself in the flight and have more fun. 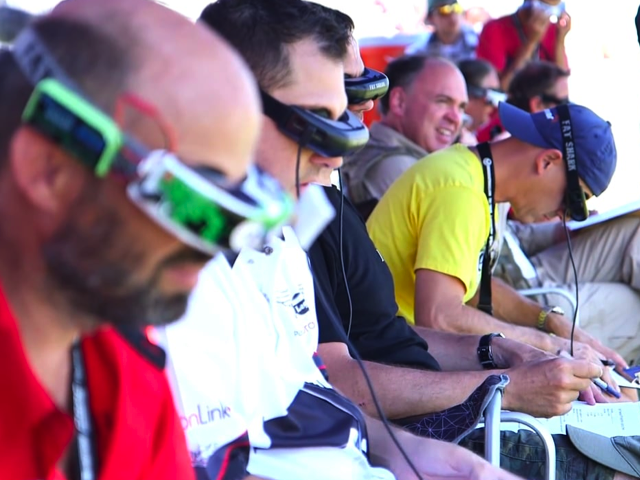 In fact, this is the preferred display option for drone racing, a revolutionary sport in the industry. There are pros and cons to using goggles during your FPV flight. As I mentioned, the upside is that you’ll have a better and more authentic flying experience. It will be like you’re in the air controlling the drone. The downside is that FPV goggles typically cost more than standard transmitter displays. Depending on the quality, they can easily exceed $500. Still, they’re well worth the price in my opinion. Another potential downside to FPV goggles is that they limit your peripheral vision. In other words, you won’t be able to see any obstacles that are just outside the limits of the camera. That’s where having a spotter comes into play, which we’ll talk about now. A spotter is basically a person who will watch for obstacles that are just outside your vision while flying FPV. This is a great way to decrease the chances of a crash. If you’re flying with FPV goggles, then having a spotter is even more important. It’s a lot like the teamwork between a sniper and a spotter. The spotter tracks obstacles in the environment while the sniper focuses on the target. Just remember: drone etiquette says that you should return the favor! Camera: It all starts with your drone’s camera. It goes without saying that the higher the quality of the camera, the better your FPV experience is going to be. This is why flying drones like the DJI Phantom 4 is so exciting. Display: As the drone’s camera records the surroundings, it simultaneously sends video signals to the display. Recall from earlier in the article that you can either go with a standard transmitter display or FPV goggles. Either one works. Transmitter: This component is responsible for transmitting the video feed from your drone to your display. There are high-quality transmitters that cost more and low-quality transmitters that cost less. Make sure you pick the right one. Receiver: This is the thing that accepts the signal. Just like the transmitter, there are high-quality and low-quality receivers. Remember that you get what you pay for so we don’t recommend being cheap when shopping for a receiver. How much does it cost to setup an FPV system on an existing drone? Usually, it’s rare to exceed $1,000. Most flyers can get by spending between $300 and $700. There are dozens of great YouTube videos that will walk you step-by-step on how to put these components together. I highly recommend checking these out when getting started. Just because you buy a good FPV setup, doesn’t mean you’ll be able to travel very far. That comes from buying a quality antenna. A good antenna has the potential to double your drone’s range. Now you’ll be able to fly further with your FPV setup rather than be stuck flying up to 100 feet away. There are many quality antennas out there that are beyond the scope of this article. Finally, let’s talk about the law, because this is where a lot of flyers get confused. Drone laws state that you cannot fly your drone more than eye views’ distance away. When people fly FPV, they often get tempted to fly up to a mile (or more) away. While the chances of being caught are low, just know that you can get in trouble for this. Breaking this law could result in a fine or a confiscation of your drone. When flying via FPV, just play it safe and keep your drone relatively close (within normal eye’s view). Flying an FPV drone is a lot of fun. Once you do it, you’ll be hooked. Just remember to do it responsibly to avoid getting in trouble. Remember that you can either build an FPV drone yourself, or buy one. Both are equally effective. If you have any questions, leave a comment or send us a message. We’ll be happy to answer it for you. Fly safe.